There's a Zelda visual guide book coming soon to celebrate the 25th anniversary of the game series. The Legend of Zelda was released on 21 February 1986. The Japanese title is ハイラル・ヒストリア ゼルダの伝説大全: 任天堂公式ガイドブック. The book is going to be 274 pages. Hey Parka, longtime reader, but first-time poster! Is there any chance of this getting translated into an English release? I would definitly buy it! 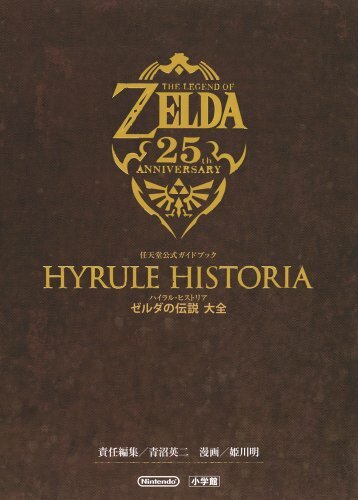 consider nintendo dont usually release artbook, and this is zelda's 25 annivasary, so i think they might release it here. if not i guess i will order the japanese ver, but amazon jp dont have the buy option anymore, and shipping is 40 which makes it $80 total. just ordered my copy from your link. thanks once again for your brilliant blog. I'm a french fan of the zelda saga. And I have read somewhere that Soleil Edition is fighting to obtain the right to release the book in France. But no more news about it... So if there is someone who know something more could you please post a comment here. THANK YOU SO MUCH FOR THE INFORMATION!!!!!! !I was waiting for this!